Most cruise ship visitors to St. Kitts arrive at Porte Zante in Basseterre. Port Zante is a 30 acre cruise village with duty-free shopping built on land reclaimed from the sea. Often Port Zante is all that visitors see of Basseterre as they travel off to St. Kitts beaches or attractions such as Brimstone Hill. However, there is another Basseterre. 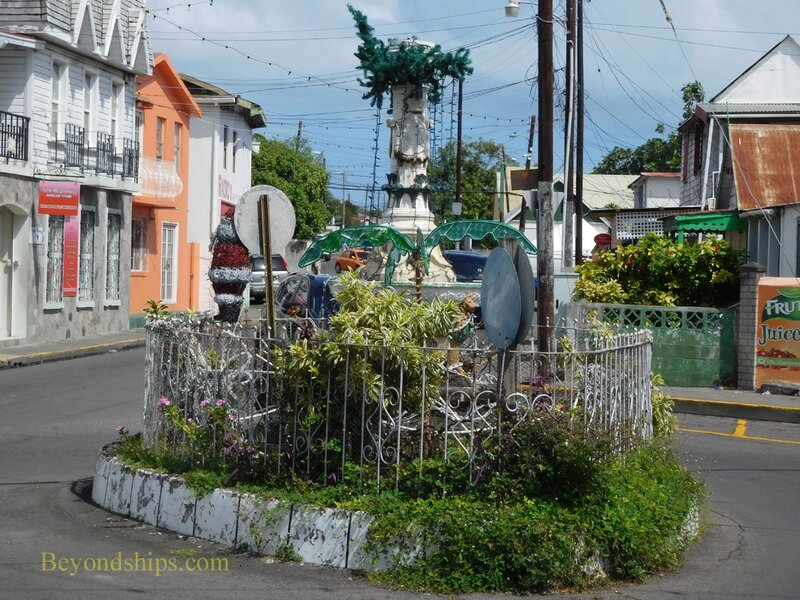 Exploring this other Basseterre would not be first on my list of things to do in St. Kitts, but it is an interesting thing to do if you have some extra time or just want to know more about the real Caribbean. 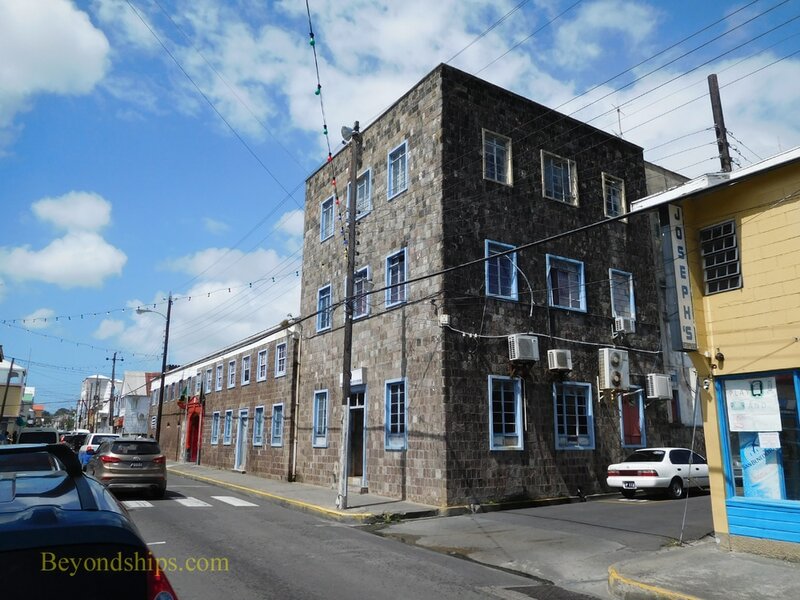 The boundary between the new cruise village and traditional Basseterre is the Old Treasury Building. After emancipation in 1838, planters who imported an indentured servant to the island were required to deposit with the treasury a sum equal to the return passage to his or her place of origin for each servant. Many of the servants elected to stay on the island after their period of indenture ended. Therefore, in the late 19th century, it was decided to build a treasury building with the unused passage money. The foundation stone for this Georgian-style building was laid in 1894 by Lady Haynes-Smith. 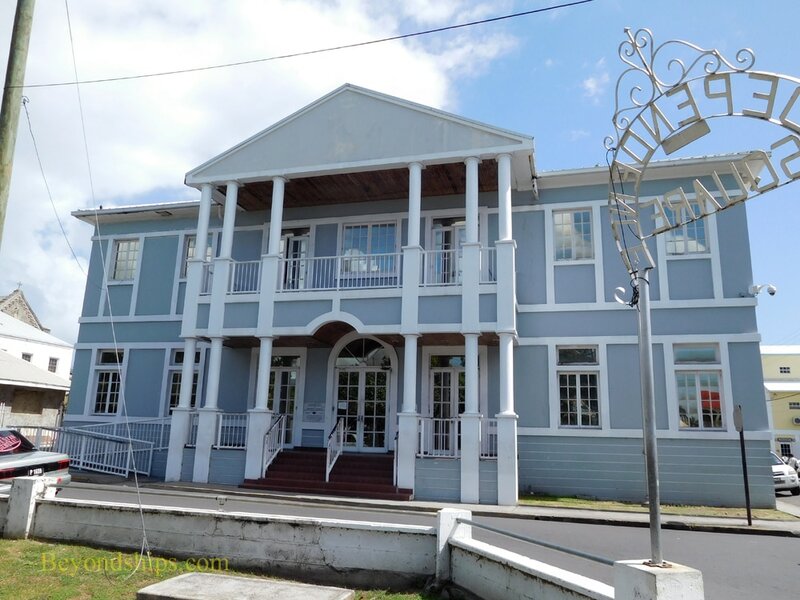 Today, the building serves as the home of St. Kitts' National Museum. Passing through the archway in the center of the Old Treasury Building, you enter a much different world. For one thing, there are cars and trucks trying to navigate through the narrow streets. This is where the people of Basseterre live and go about their daily lives. It is not glamorous and some of the buildings look a little tired but it is real life, not something created for the tourists. Crossing Bay Road, you come to the Circus. In the Victorian age, this intersection was vaguely patterned after London's Piccadilly Circus. Four main roads radiate out from the Circus. Its centerpiece is the Berkeley Memorial, named in honor of a 19th century president of the Legislative Council Thomas Berkeley. Erected in 1883, this cast iron tower houses four clock faces and also serves as a drinking fountain. It is a favorite gathering point for locals. Turning right at the memorial and walking a block or so east, you come to Independence Square. 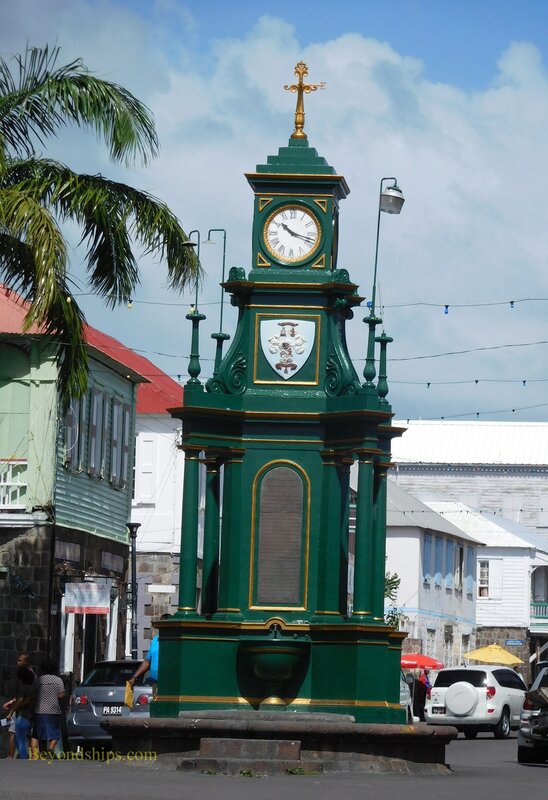 In the 18th century, the local government purchased what was then a pasture on the outskirts of Basseterre for use as a parade ground for the militia. However, it soon became a gathering place for slaves who came together to sell items that they had produced and to socialize. After emancipation, the population of Basseterre grew and pipes were laid in order to bring water to the city from the countryside. A fountain was built at the center of the square to celebrate the completion of the pipeline. Originally called Pall Mall Square, the name of this small park was changed in 1983 to mark the independence of St. Kitts and Nevis. The basic design of the park is in the shape of a Union Jack. At one time, it was known for its ornamental trees and gardens but hurricanes in the 1990s destroyed many of the plants. Today, it is a pleasant green space in the center of town. Surrounding Independence Square are a number of important buildings. In the late 18th century a courthouse was built near the southeast corner of the square. Over time, it became the center of administration of the island housing not only the courts but the Assembly and the Council. That building burnt to the ground in 1985 and a new courthouse was built, which captures the look of its predecessor. Nearby is an impressive large stone church. After the British took St. Kitts from the French in the 18th century, public worship of the Catholic religion was forbidden. An act was passed in 1829, removing this restriction. 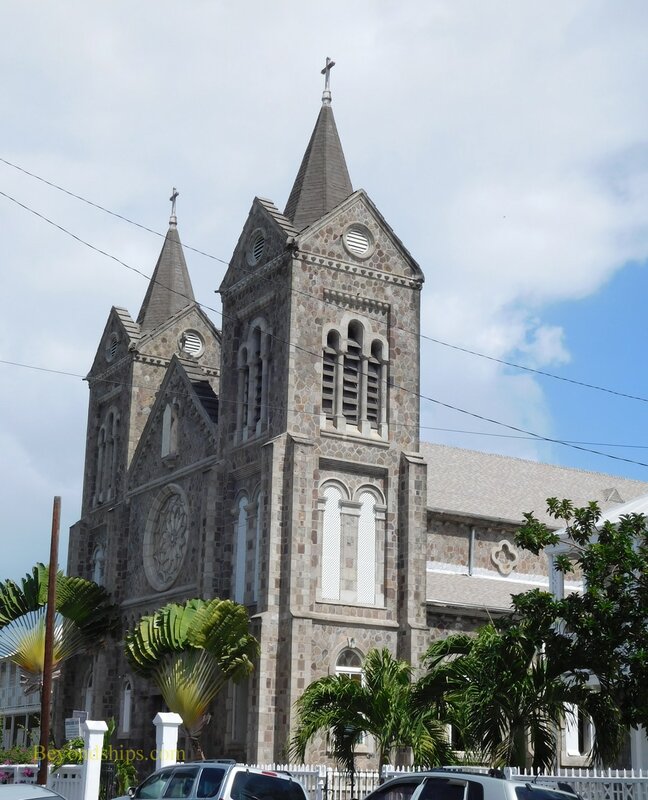 To commemorate the centenary of this act, plans were formed to build a new church to replace Basseterre's existing Catholic church, which had become inadequate to serve Basseterre's Catholic community. The new church was begun in 1927 and completed less than two years later employing squared stones brought from Nevis. The church was elevated to the status of co-cathedral in 1991, sharing its bishop with the diocese of St. John's Antigua. Northeast of Independence Square at the Bakers Corner roundabout is the Victoria Monument. Erected in 1902 at another location, the monument originally featured a statue of the young Queen Victoria. The monument was brought to its present location in the 1960s. Unfortunately, when we visited it in 2017, only the pedestal remained. Walking north along Cayon Street you pass the colonial era police station and various local shops. 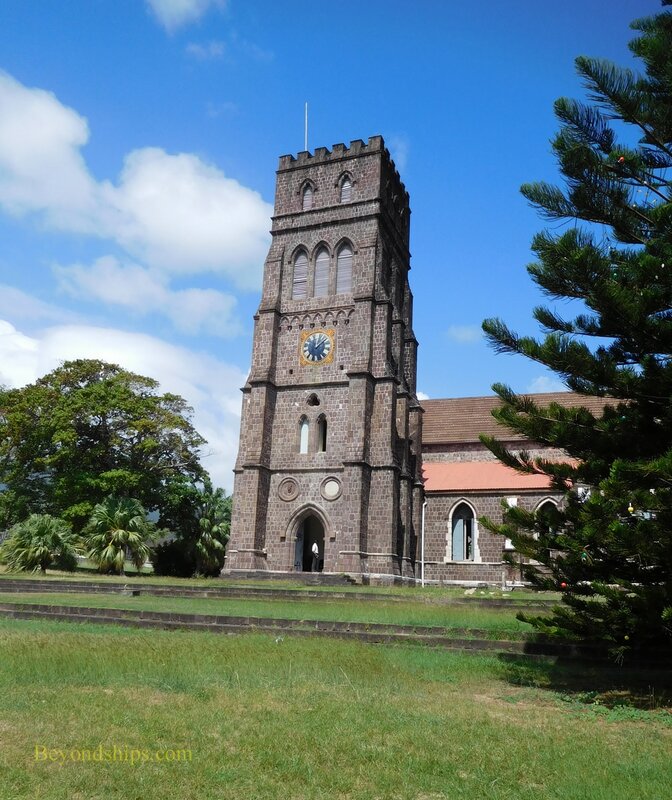 Eventually, you come to St. George's Anglican Church, the largest church in Basseterre. This site has been a place of worship since French Jesuits built a church here in the late 17th century. That church was destroyed in the fighting between the British and French in the early 1700s but was subsequently rebuilt as an Anglican church. Another fire, an earthquake and a hurricane eventually destroyed the rebuilt church. The church we see today was consecrated in 1858. However another fire in 1867, severely damaged it. Once again, the church was rebuilt. 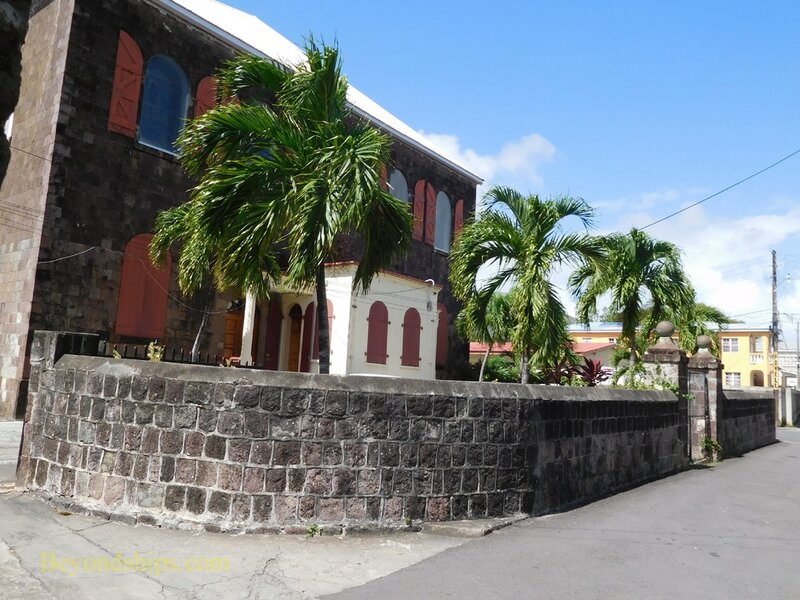 Today, the stone church stands upon a rise overlooking downtown Basseterre and the cruise port. It would not look out of place in the English countryside. Inside, the floor of the church includes grave markings just as in an English parish church, some of which pre-date the current structure. Also of interest are the baptistery and the 19th century pipe organ, which I had the pleasure of playing. Visitors can also make the arduous climb to the top of the tower for a panoramic view of the town and port. Just behind St. George's is the Wesley Chapel, a Methodist church. This square stone building was erected in 1822 on the site of an earlier Methodist chapel. 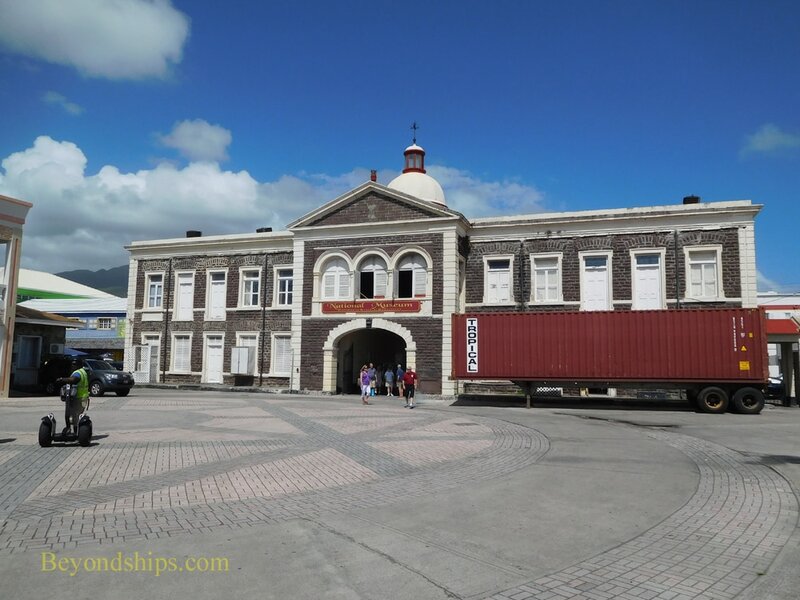 It is the oldest surviving public building in Basseterre. Across Victoria Road from the chapel is Warner Park. In 1926, the local government purchased this area, which had been plantation land, in order to build a recreation center near the center of town. This included creating a cricket ground and over the years, St. Kitts has produced several great cricket players. In 2007, Warner Park hosted several games of the World Cup of Cricket. 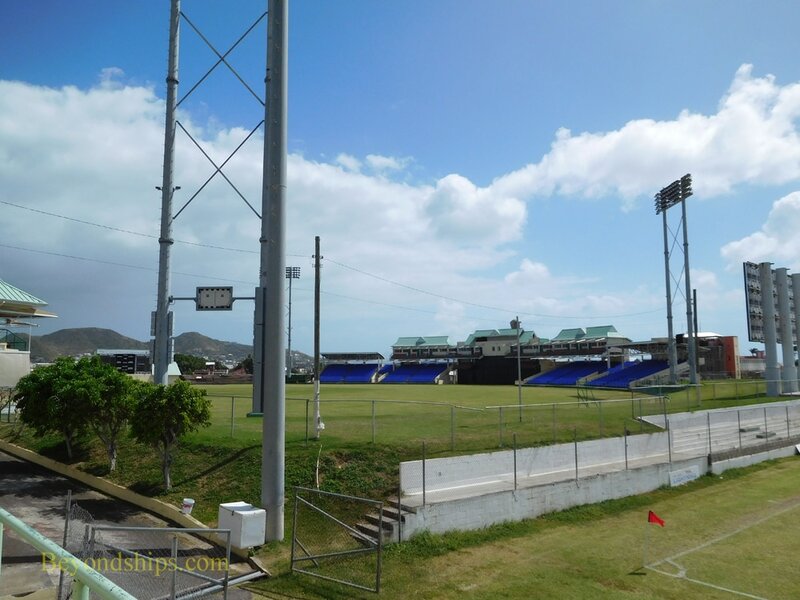 As a result, St. Kitts and Nevis became the smallest country to host a World Cup event. Warner Park is a modern complex with grandstands and other professional facilities. It contains a football (soccer) field as well as the cricket grounds. Below: The cricket grounds at Warner Park. Above: The Old Treasury Building, now the National Museum. Below: The Berkely Memorial in the center of the Circus. Above: Scenes from Independence Square. Above: The remains of the Victoria Monument.